Enroll through the Active.com online enrollment system. Please note that all class lists will be finalized with input from the Guides, so if you end up on a waiting list for a class that your child really wants or needs for some reason, please let your guide know and we will take this information into account when finalizing the class rosters. Use THIS LINK to enroll in enrichment courses. 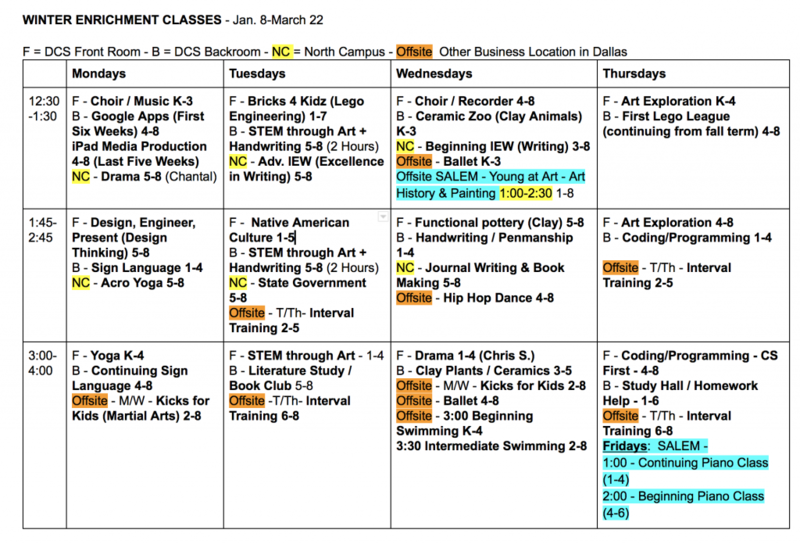 Below is the finalized schedule grid / list of winter enrichment classes. NC means that those classes will take place at our North Campus building in downtown Dallas. Offsite means that those classes will take place at a business location in downtown Dallas (or swimming will be at the Dallas Aquatic Center). F & B mean the Front and Back rooms in the DCS main building. Classes not in bold have not yet been confirmed, though nearly any class could still switch days or times between now and Dec. 12. If you have any last minute recommendations for other enrichment instructors, please let me know. We are also still looking for a site where we can hold some classes in Salem, in case you know of any available conference rooms or classrooms we could use there. We have several interesting classes lined up for spring term already as well, including Oregon Geology, 4H, Art History, and Music Theory, and we are still searching for a location in Salem (possibly a meeting room at a church or business?) to hold more enrichment courses in Salem spring term in case you have any suggestions. Before we open our online enrollment system around Dec. 12, please take a moment to register yourself and your children (DCS Students) in the Active.com system as soon as possible so that when we DO open course enrollment, you will be all set up to select classes and not have to spend the time entering registration information at that time!